Becky's been going through old photographs, redoing the family photos on the wall upstairs. 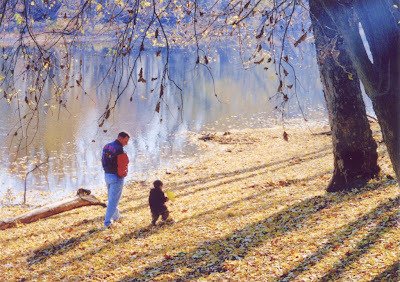 One of these photos, a photo of Eddie (when he was two) and I walking along the river at Ball's Bluff, was badly faded. This photo was superbly composed, and remains one of Becky and my favorite photos. We finally found the old 35mm film negative, and got it redeveloped and scanned in digitally. It really is one spectacular photo! Becky has a marvelous eye. Of course, it's still spring in the garden. The peonies are blooming, and this variety remains my personal favorite. It is so delicately colored that by day two of the bloom, the sun has bleached all the petals to pale pink and off-white. You must appreciate this flower very quickly. 1st. I miss your posts! 2nd. The picture is indeed a good one! Is there a way to photoshop Luke and Becky somewhere around it? ;-) tricky! 3rd. I am going to post a picture that is a resemble of yours, but in the LeDuc-Vuitton context.